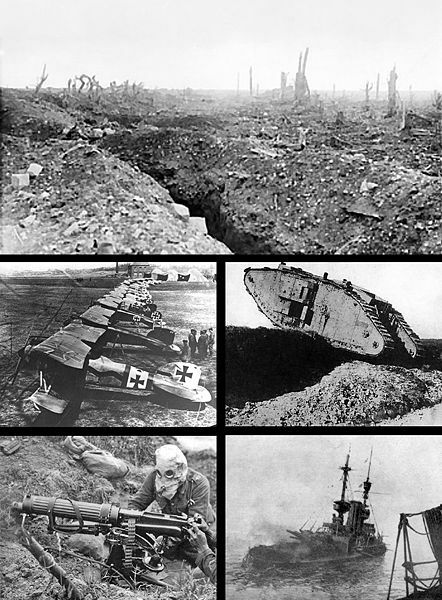 World War I was the first big war of the 20th century. It started with an assassination and involved more countries than any war before it. Many European countries made agreements with each other and fought for four years. 9 million soldiers and 6 million civilians lost their lives in the war. On June 28, 1914 the Austrian Archduke Franz Ferdinand was murdered in Sarajevo, at that time the capital of Bosnia- Herzegovina, one of Austria-Hungary's provinces. The Austrian government thought that Serbia was behind the killing and declared war. Although the murder of the Austrian archduke started the war it had deeper roots. Germany had become a powerful nation in Europe. Its army became bigger and mightier. It always had close ties to Austria Hungary. Later on, other countries joined these so-called Central Powers. On the other side, Russia, France and Great Britain supported Serbia. These nations became the Entente. The United States entered the war in 1917. It supported the Allies and brought soldiers and war material that they needed to win the war. In the fall of 1918 the Central Powers surrendered. In the following peace conferences the multi-national countries of Europe fell apart and new countries were created. The peace settlement also created conditions that helped start World War II in 1939.